We all know that winter comes with too much cold, even if it is mild here in Florida. This colder weather tends to increase your chances of getting exposed to a different disposition of triggers. If you are a person who is allergic to pollen or summer allergies, there is a chance of getting a break when the weather becomes colder. By having a pile of rotting leaves and other yard waste around your home, it creates a perfect breeding area for mildew and mold. When the mold spores get into the air, they provoke your allergies. When wood is cut and then stored outside, the pile becomes a wet, unclean area. By bringing the wood inside the house even for a short while, it could cause you to have a reaction. When the cold season kicks in, it is logical for you to have your pets inside the house more often. During the winter season is when you are exposed to dander escalation, which can result in more allergy response. Dust mites can be found in many places around your house, including furniture, bedding, and carpet. Vacuuming, dusting, washing linens in hot water, and removing mold with bleach regularly can reduce the chances of you getting exposed to dust mites. -Washing away allergens by cleaning your hand and face frequently. -Cleaning your bedding with hot water to kill off dust mites. 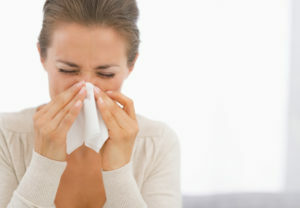 -Taking medication for allergies to relieve symptoms. -Avoiding the things that you are allergic to. -Trying linens that are specially made to be less suitable to allergens. If you intend to use medication for your allergy, it is important to first consult your doctor or pharmacist before taking any medicine. This is necessary because and ENT can let you know whether it is appropriate for your symptoms and discuss side effects. Make your consultation appointment today with Palm Beach Sinus Doctors.